Piece together a charming scene of nature's woodland friends with Mudpuppy's Forest Friends Jumbo Puzzle. A moose, bear, deer, and a family of owls are just a few of the delightful critters you'll find as you assemble the 25 oversized and durable puzzle pieces. See what other friendly animals you can discover! 25 jumbo pieces. Packaged in a sturdy box with colorful rope handle. Puzzle: 22 x 22 in. (56 x 56 cm). Box: 9 x 9 x 3.5 in. (23 x 23 x 9 cm). Puzzle greyboard contains 90 percent recycled paper. Packaging contains 70 percent recycled paper. Printed with nontoxic, soy-based inks. Ages 2 and up. Games We Played 1000 piece jigsaw puzzle. All the old family favorites are included in this collage family puzzle by Lois B. Sutton. Old Maid, Sorry, Clue, Tiddly Winks, Monopoly, and many more are featured in this puzzle. So many to choose from. Which was your family favorite? Artist Lois Sutton. 1000 piece jigsaw puzzle. Finished size is 24 x 30. Candy Wrappers 1000 piece jigsaw puzzle. Take a sweet stroll down memory lane with our new Cany Wrapper puzzle, which has quickly become one of our best selling jigsaws. Artist Charlie Girard. 1000 piece jigsaw puzzle. Finished size 24 x 30. A small flock of wood ducks land on a quiet backwater pond in this David A. Maass painting. Proudly made in the U.S.A. 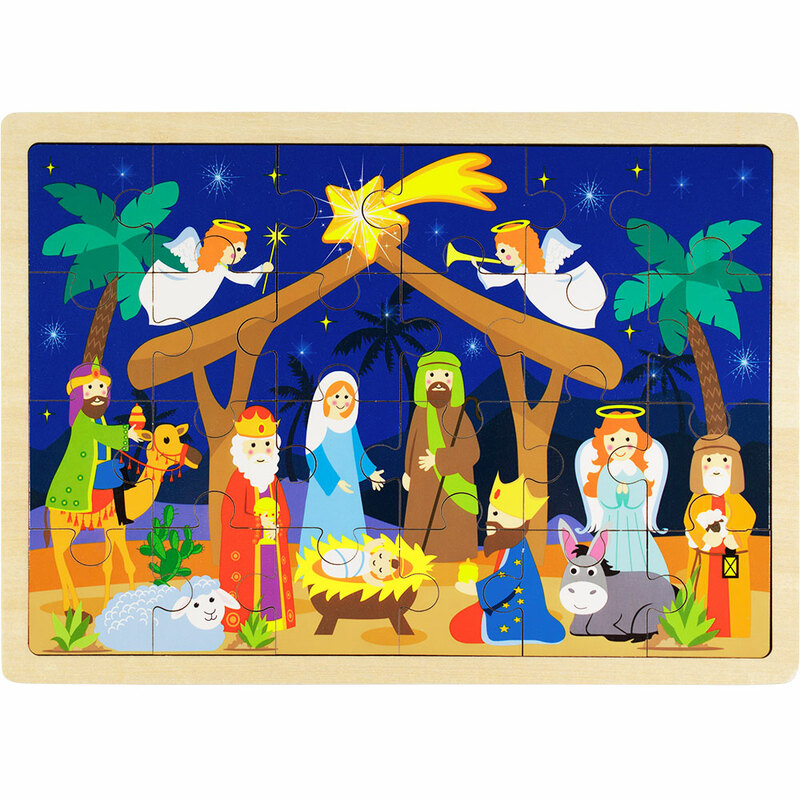 This 40-piece puzzle is a great item for kids 3 years and up. It's a great way to teach children early about birds and appreciation of nature. 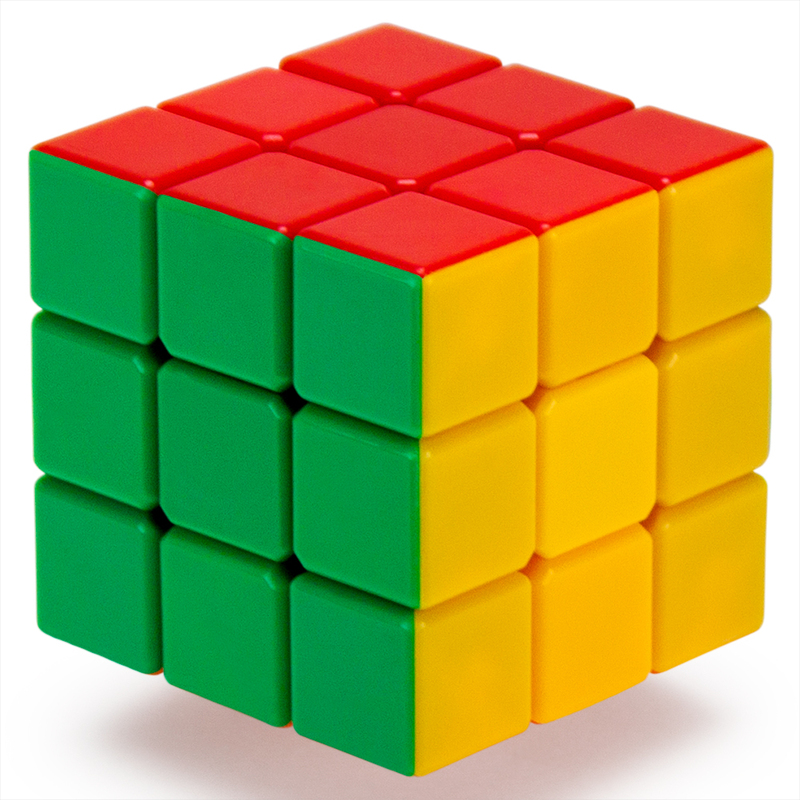 We've built a better puzzle cube, perfect for beginners and experts alike. If you think you've hit your peak solution time, think again. Still the standard 57 cubic millimeters, but leaner, faster, and tougher than the original. Our puzzle cube turns fluidly and won't jam or hang, no matter how fast those fingers are flying. Calibrated and lubricated, this cube is fast right out of the box, but the tension is easily customized with a turn of one of the internal screws. Even better, this cube is stickerless, which means it'll stay display-ready after months of use and abuse. No torn stickers, no worn colors, no crooked replacements. Perfect for beginners and experts alike. If you think you've hit your peak solution time, think again. Still the standard 57 cubic millimeters, but leaner, faster, and tougher than the original. Our puzzle cube turns fluidly and won't jam or hang, no matter how fast those fingers are flying. Calibrated and lubricated, this cube is fast right out of the box, but the tension is easily customized with a turn of one of the internal screws. Even better, this cube is stickerless, which means it'll stay display-ready after months of use and abuse. No torn stickers, no worn colors, no crooked replacements. 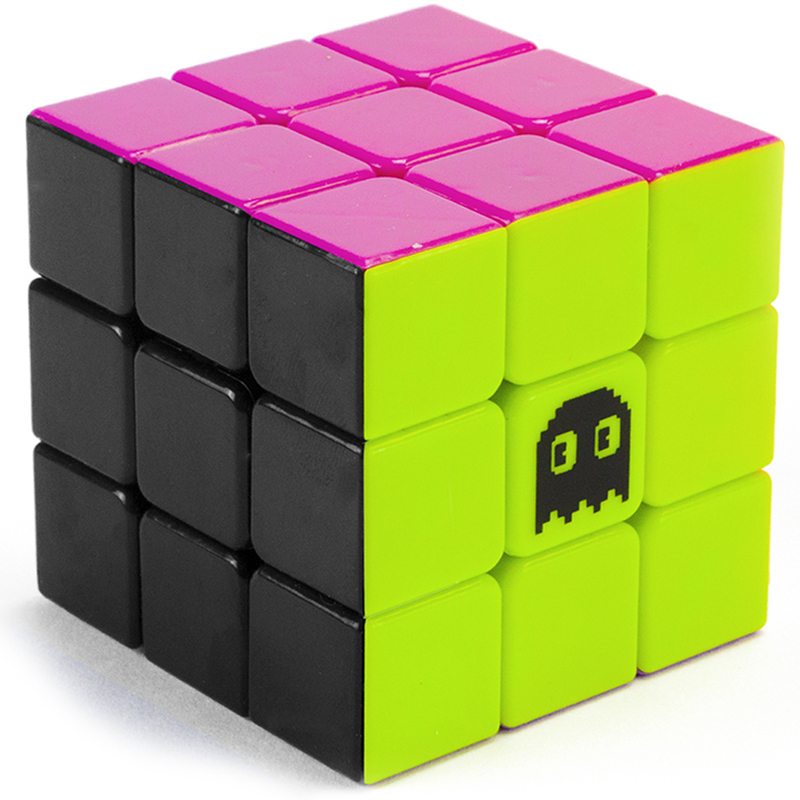 The 80s Mod: Our classic high-performance cube now rocks radical neons and a 16-bit ghost decal. So get stoked. Speed solving has never looked so gnarly. Why You'll Love It: Colorful, chunky pieces up to 4.5" wide that are easy to grab and match! 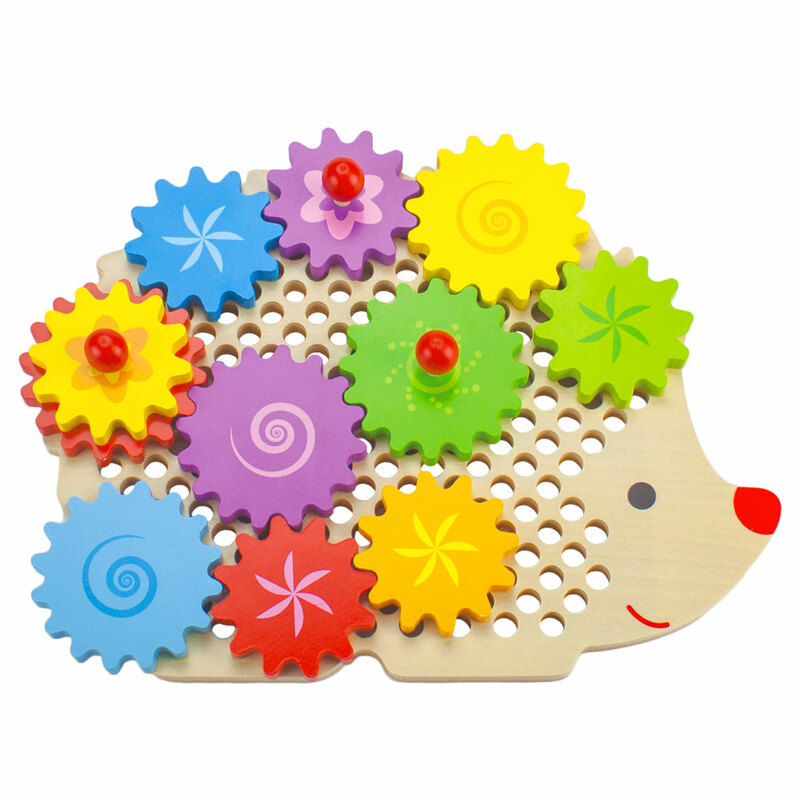 Develops fine motor skills, shape orientation, memory, and creative expression. "I am Professor Poplar, and this is my patented Alphabet Puzzle Board. It is a terrific, sensory way to learn the shapes of the alphabet with your hands! 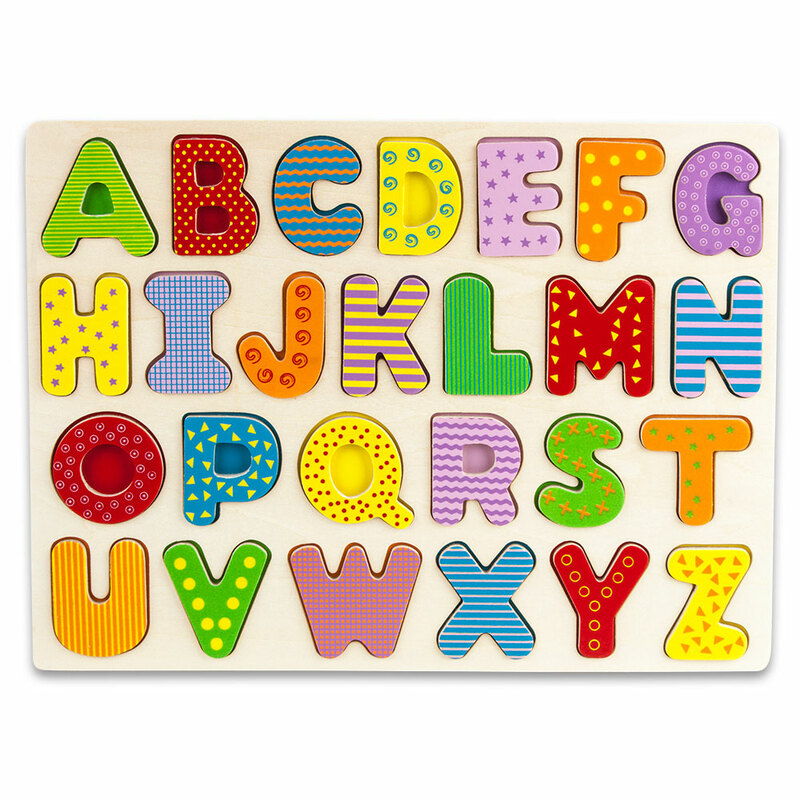 I've painted each wooden letter with bright colors and bold patterns, so no two are alike. It is quite the sight to see! Now, I have carved out a space for each of the 26 letters, and it is your job to put each one back in its spot. So use your sense of touch (and sight!) to match the shapes and colors to puzzle out a solution. Then, dump them out and start again! For my advanced scholars: Try spelling out short words. There are ever so many of them to learn!" Why You'll Love It: Colorful, chunky pieces up to 2" wide that are easy to grab and match! Develops fine motor skills, shape orientation, memory, and creative expression. Match the barnyard helpers with Professor Poplar! "I am Professor Poplar, and this is my patented Barnyard Peg Puzzle. 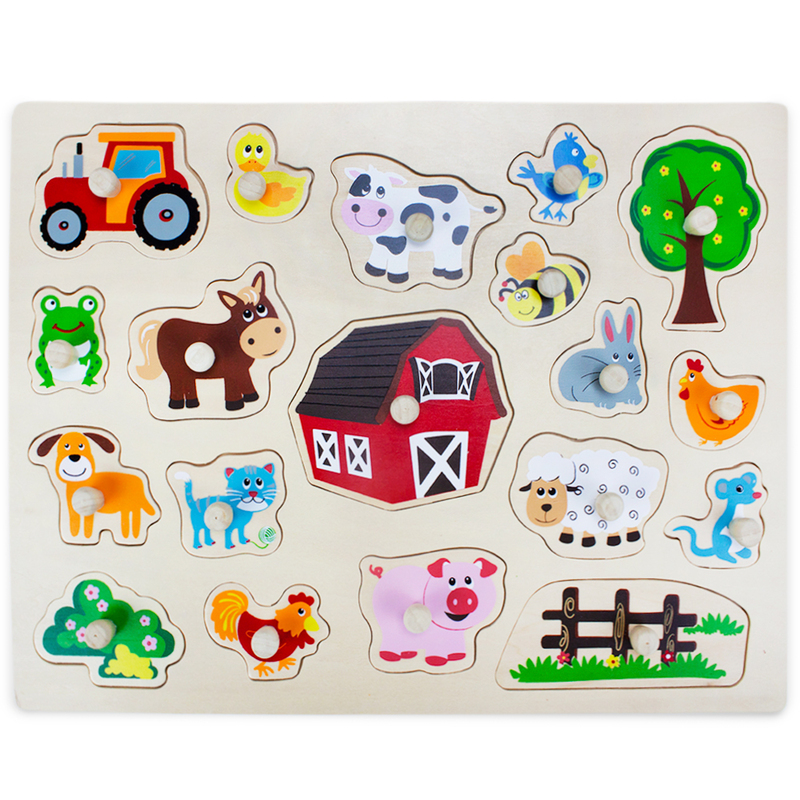 It's a terrific, sensory way to learn the shapes and sizes of all sorts of barnyard helpers! The spotted cow, the muddy pig, even the industrious tractor, they're all here! It is quite the sight to see. Now, I have carved out a space for each barnyard helper, and it is your job to match each one to its spot. But don't worry, I've left you a hint under each peg! So use your sense of touch (and sight!) to match the shapes and pictures to puzzle out a solution. Then, dump them out and start again! For my advanced scholars: Do you know the name of each barnyard helper? Can you tell how it helps out around the farm?" Why You'll Love It: Colorful, chunky pieces up to 3.5" wide that are easy to grab and match! Develops fine motor skills, shape orientation, memory, and creative expression. 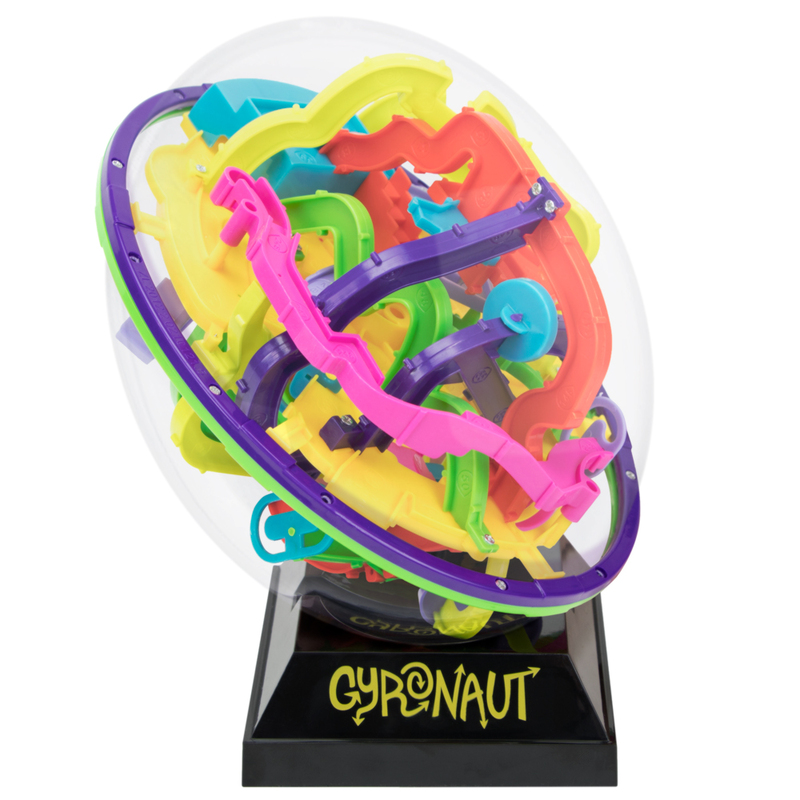 A Gyronaut is a twisty, turny, three-dimensional puzzle whirled up into a ball! Use equal parts wits, reflexes, and gravity to overcome the obstacles and guide the ball through a tangled knot of track! Can You Untangle the Naut? When you're ready, push it to the limit with Gyronaut Omega! Packed tight with a whopping 299 obstacles, this oblate spheroid is the most intricate and expansive puzzle ball on planet Earth. Buff up your skills using the 5 checkpoints, then get ready to climb the Mt. Everest of puzzles: Can you do it all in just one run? There are over 290 deliciously devious, mind-melting obstacles packed into this box, just waiting for you to puzzle them out! Do you have the finesse and fearlessness to master the lobe-lickin' Gravity Well? 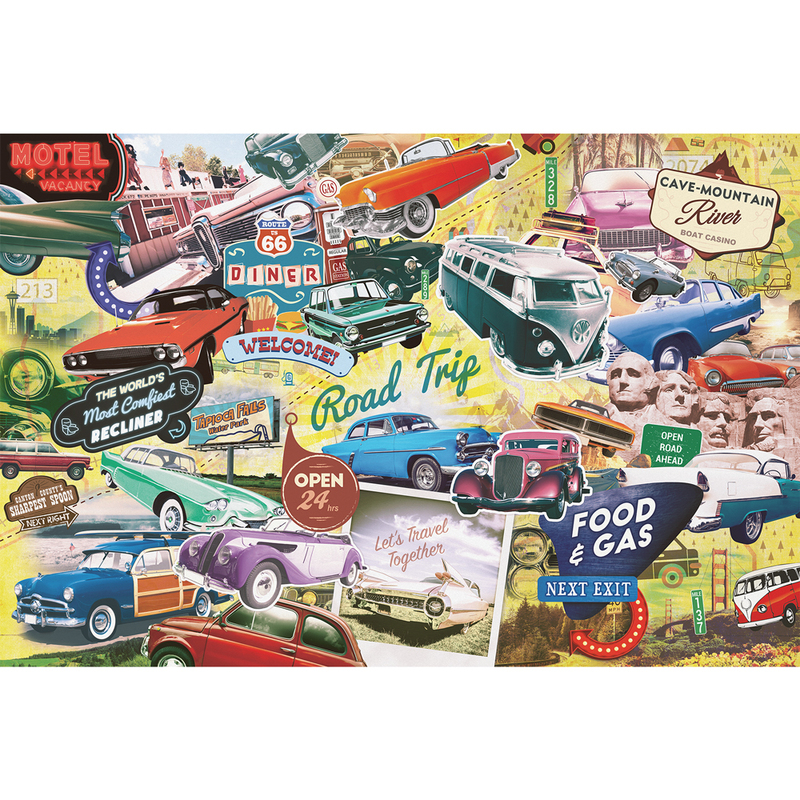 This challenging 1,000-piece collage puzzle distills pure Americana down to its most classic components: chromed cars and chromed diners, mile markers and motels, roadside attractions and national landmarks, neon lights and dazzling sights. Finished size measures 29.5" x 19.75", ages 12 and up. This 1,000-piece Americana-themed jigsaw puzzle is a worthy addition to the collections of novice and and expert puzzlers alike. And with a finished size measuring nearly two and a half feet wide it makes a great display piece once it's solved! Featuring an exciting collage of classic cars, American landmarks, and tongue-in-cheek roadside attractions, there's a ton of small details to discover lovingly packed into each inch, which makes this puzzle a blast from beginning to end. You Want What When? 500 piece puzzle. Featuring a very frantic looking squirrel, this puzzle makes a great gift. Not suitable for children under 3 years due to small parts. Finished size is 20.5 inch by 15 inch. This is one puzzle sure to leave you floored. Consisting of 48 large pieces, when fully assembled this jumbo floor puzzle is 3 feet tall and 2 feet wide. But that isn't the best part... this floor puzzle is actually two puzzles! Just flip for more fun! 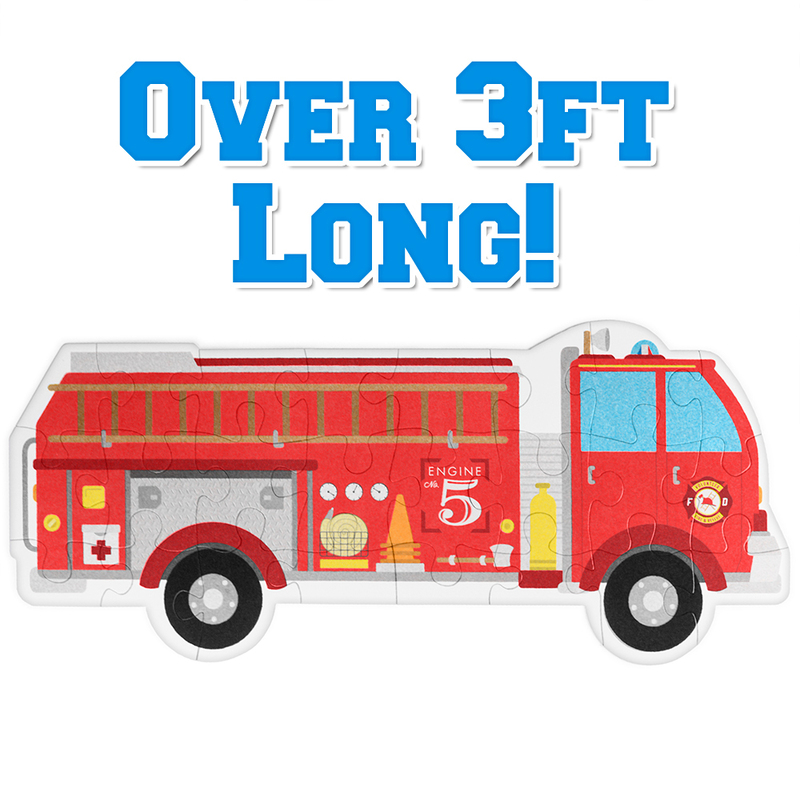 Thanks to its gigantic size, this floor puzzle is assembled with chunky cardboard pieces up to 5" long which are easily manipulated by small hands. Puzzles are great tools for developing your child's fine motor skills, as well as their cognition and ability to solve problems. Even better, this puzzle invites collaboration. Lend your child a hand in placing the pieces, or pack up the puzzle into the sturdy, reusable box and take it on a playdate. Build, tear down, and build again for hours of jumbo-sized fun in a tiny, portable package. I'm Professor Poplar, and these are my patented Barnyard Animals Puzzle Stampers. They're a terrific, sensory way to learn the shapes and sizes of classic farm objects by creating artistic masterpieces! There's a cow, chicken, and duck, a pig, sheep, horse, and even a barn and tractor! And it's quite easy to start stamping, just grab your chosen piece by its peg, then press it down into the ink, lift, and press onto your paper. You'll be creating barnyard designs in no time! When you've finished, don't forget to put all the puzzle pieces back where they belong. Use your sense of touch to match the shapes and pictures to puzzle out a solution. And, for my advanced scholars: Do you know the name of each barnyard animal? What about the equipment? Can you tell me what all the animals are called and what sounds they make? Why you'll love it:These colorful pieces are easy to grab and match, the ink is washable, and this multimodal toy not only develops fine motor skills, shape orientation, and memory, but it also a great source of creative expression. I'm Professor Poplar, and these are my patented Marine Animals Puzzle Stampers. They're a terrific, sensory way to learn the shapes and sizes of nine different sea creatures by creating artistic masterpieces! There's an octopus, starfish, and turtle, a whale, a clam, and a seahorse, a crab, a fish, and even a coral! And it's quite easy to start stamping, just grab your chosen animal by its peg, then press it down into the ink, lift, and press onto your paper. You'll be creating aquatic designs in no time! When you've finished, don't forget to put all the puzzle pieces back where they belong. Use your sense of touch to match the shapes and pictures to puzzle out a solution. And, for my advanced scholars: Do you know the name of each Marine Animal? Can you tell me what they are called and what they do? Match the Exotic Safari Animals with Professor Poplar! My name is Professor Poplar, and this is my patented Exotic Safari Puzzle Board, with eight extra-chunky shapes! The tall giraffe, the hungry hippo, and the spiny hedgehog, they're all here, and it's quite the sight to see. 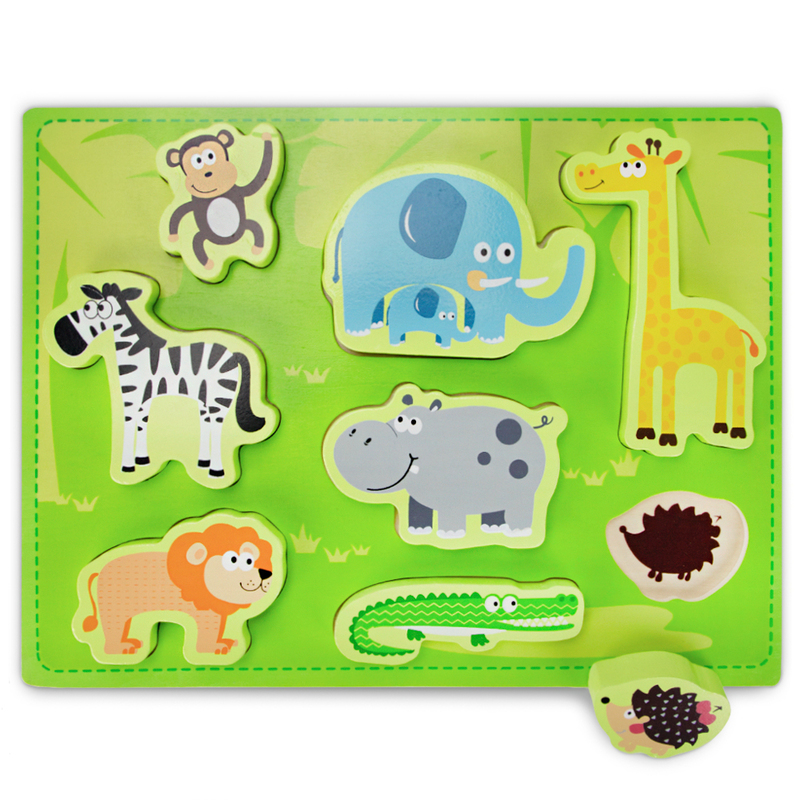 Playing with this puzzle is a terrific, sensory way for the earliest of early learners to fell out the shapes and sizes of all sorts of exotic animals native to Africa. I've specially engineering it to engage fine motor skills and promote color-matching and problem solving! And, of course, all my puzzle pieces are cut from natural wood and finished with safe, water-based paint. Piece Together a Map of the World! My name is Professor Poplar, and this is my patented Whole Wide World map puzzle! Did you know? Earth's surface is 70 percent water. The rest of our planet holds massive areas of land, separated by water or natural features. These land masses are known as continents and there's seven of them in total, each with unique animals, weather patterns, and climates. Quite an exciting place to live, if I do say so myself! Puzzling together this jigsaw is a terrific, sensory way for young learner to piece together the complex geography of our world. And better yet, I've included all sorts of major landmarks, as well as objects on each continent. 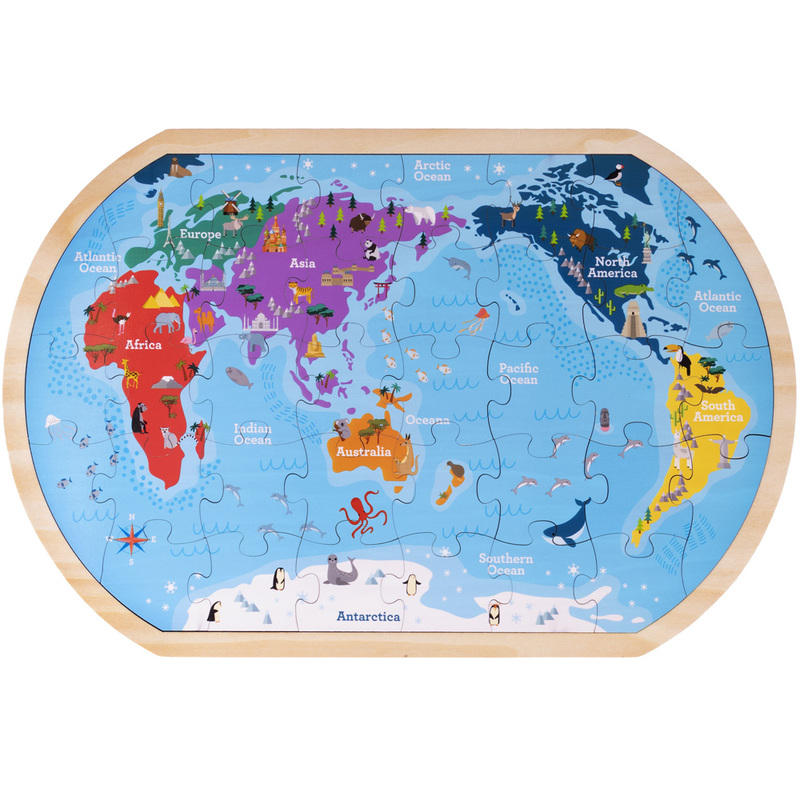 Each of the 37 jigsaw pieces fit in the 17.75" x 11.5" wooden inset frame, so you can piece together our wonderful world! 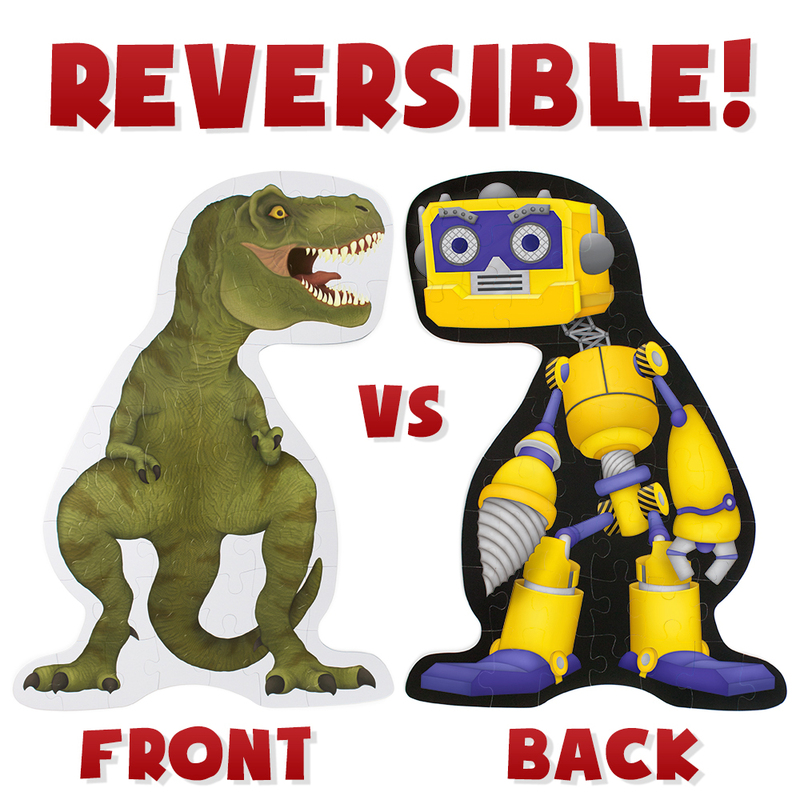 Facilitates in developing basic memory and spatial awareness skills. I'm Professor Poplar, and these are my patented People Movers Puzzle Stampers. 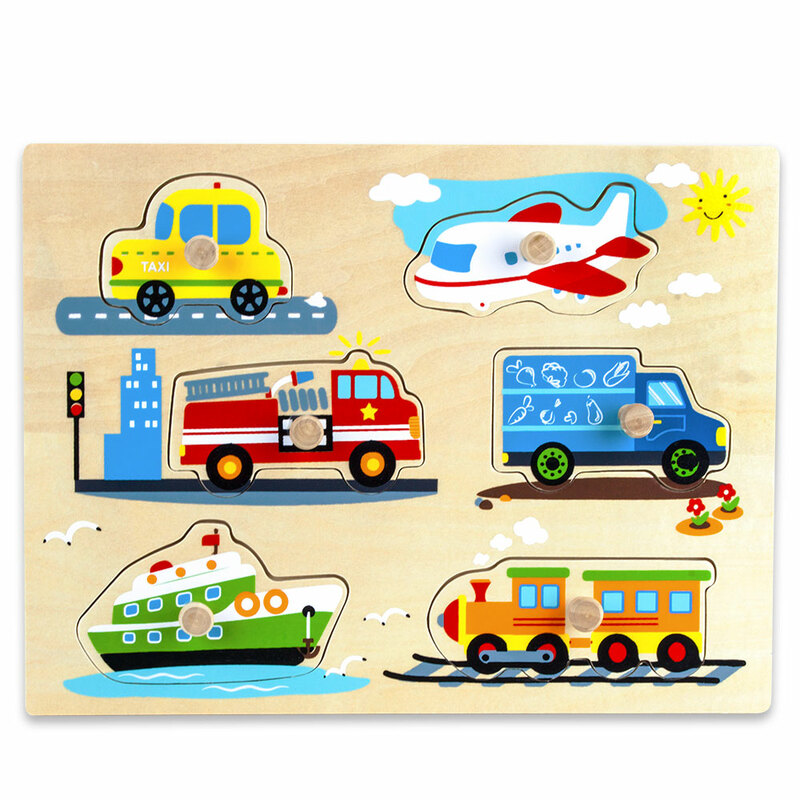 They're a terrific, sensory way to learn the shapes and sizes of seven busy vehicles by creating artistic masterpieces! There's a dump truck, ambulance, plane, tour bus, fire engine, tow truck, and a round bug of a car! And it's quite easy to start stamping, just grab your chosen piece by its peg, then press it down into the ink, lift, and press onto your paper. You'll be filling up busy city streets in no time! When you've finished, don't forget to put all the puzzle pieces back where they belong. Use your sense of touch to match the shapes and pictures to puzzle out a solution. And, for my advanced scholars: Do you know the name of each people mover? Can you tell me what they are and what they do? Why You'll Love It: There's no better way to introduce children to science than through discovery! Gear puzzles are great for independently investigating simple mechanics and cause-and-effect relationships. Placing and spinning the colorful gears during open-ended play promotes creative expression while developing logical reasoning and fine motor skills. There's something new to learn at every turn! My name is Professor Poplar, and this is my patented Barnyard Helpers Puzzle Board, with nine extra-chunky shapes! The swirly sheep, the striped cat, even the muddy pig, they're all here, and it's quite the sight to see. Playing with this puzzle is a terrific, sensory way for the earliest of early learners to fell out the shapes and sizes of all sorts of barnyard helpers around the farm. I've specially engineering it to engage fine motor skills and promote color-matching and problem solving! And, of course, all my puzzle pieces are cut from natural wood and finished with safe, water-based paint. 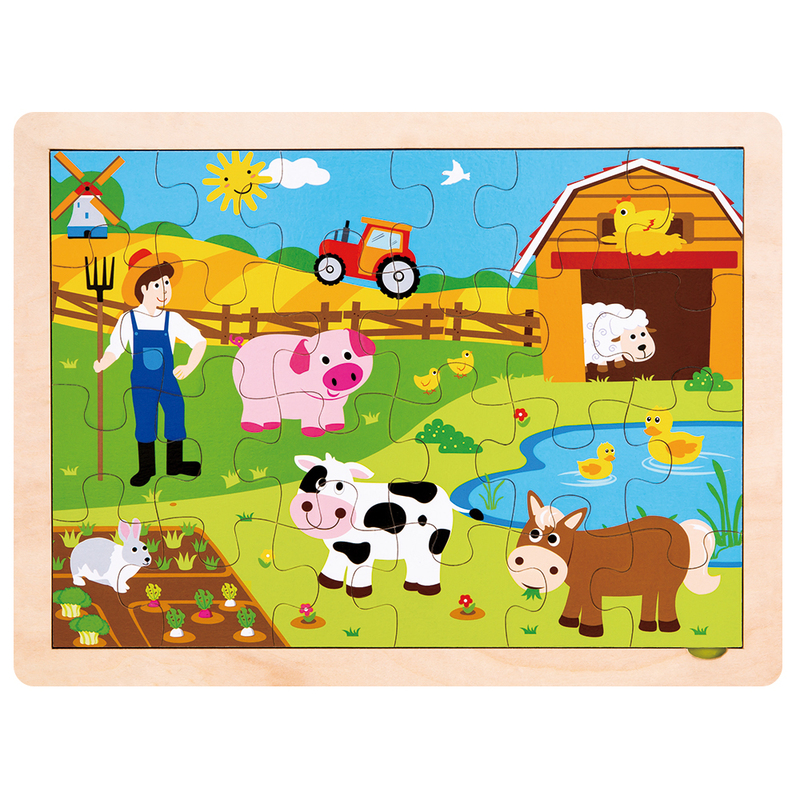 Go hog wild with these barnyard animal puzzle blocks! 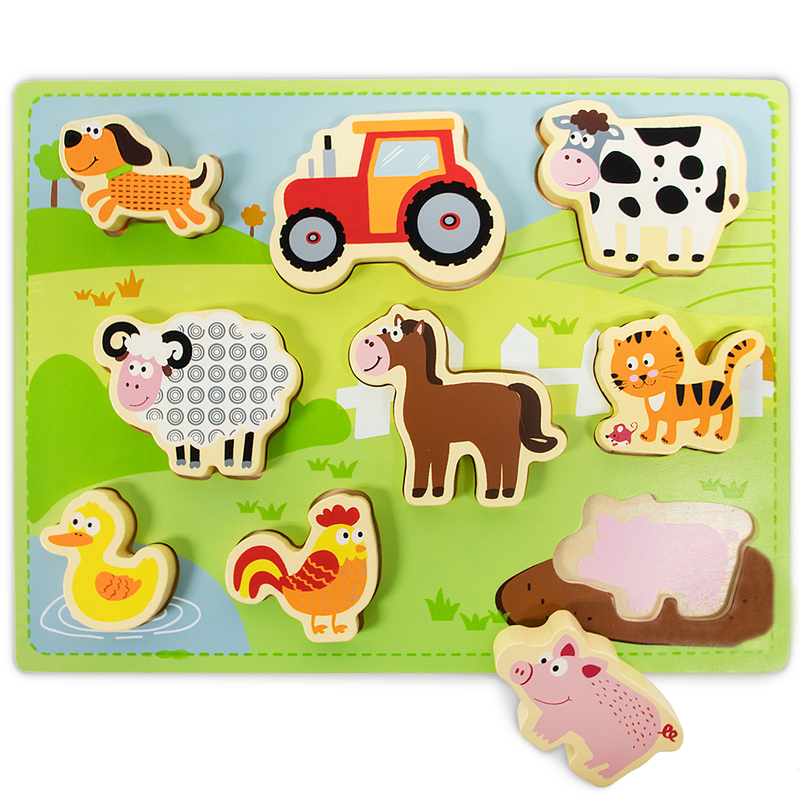 Little hands can horse around for hours with nine unique pieces that make six bright barnyard animal puzzles, including a cow, chicken, duck, horse, pig and sheep. If it's tough at first, hold your horses! These blocks will help develop fine motor skills, problem solving, hand-eye coordination and recognition skills. Made from natural blocks of wood, these pieces have been sanded smooth and brightly colored with water-based paints, for safe and fun playing until the cows come home! Piece Together a Busy Barnyard Scene with Professor Poplar! My name is Professor Poplar, and this is my patented Busy Barnyard Inset Jigsaw Puzzle! Did you know? Jigsaw puzzles were invented in London, England in 1760. They were cut from wood and used for teaching, and this puzzle is no different! Assembling this bright and sunny barnyard scene is a terrific, sensory way for early learners to develop problem solving faculties and sharpen dexterity and fine motor skills. The inset frame keeps the pieces steady and in place, and I've included the completed scene on the frame so young puzzlers who need hints can easily match up their pieces. And, of course, all my puzzle pieces are cut from natural wood and finished with safe, water-based paint. My name is Professor Poplar, and this is my patented Barnyard Helpers Peg Puzzle, only Jumbo-sized, with a whopping 19 fun barnyard shapes! The woolly sheep, the loyal dog, the buzzing bee and flittering bird, they're all here. 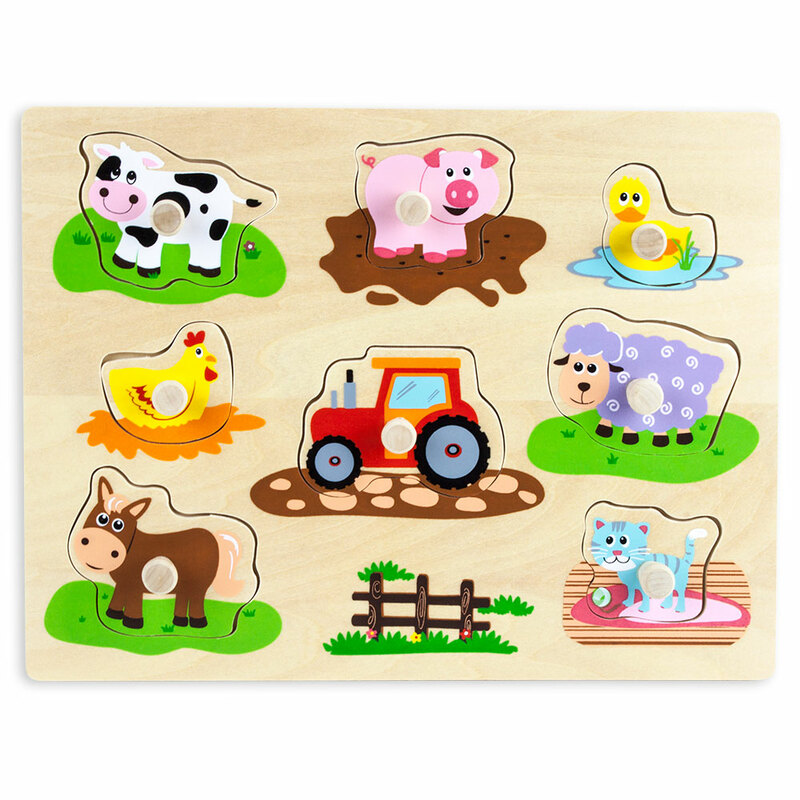 Playing with this puzzle is a terrific, sensory way for early learns to feel out the shapes and sizes of all sorts of familiar barnyard helpers. Under each cut-out there's even a handy hint! And, of course, all my puzzle pieces are cut from natural wood and finished with safe, water-based paint. Watch Gregory grow up, right before your eyes! "I am Professor Poplar, and this is my patented guide to growing up! This nice young man is Gregory, and through the power of puzzles, you can help him grow up! Everyone, even Gregory, starts out as a baby, but as you add more pieces to the puzzle, he'll mature before your very eyes. "Take him through his toddler years, then help him grow into a kid. But stay sharp, because the puzzles gain more pieces as Gregory grows! Can you piece together Gregory as a teen? Just look how long his arms and legs have gotten. And finally, with his chiseled chin and dapper blazer, you have grown-up Gregory!" Why You'll Love It: This innovative layered jigsaw design combines five puzzles inside a single base! Kids solve five stages of growing up, each with rising difficulty: baby, toddler, kid, teen, and grown-up. And, puzzling out these jigsaws develops fine motor skills and encourages critical thinking and problem solving. Piece Together a Pirate Adventure! Ollie and Mr. Noodle are ready to explore the seas! Piece together some scary sharks, a pirate ship, and a couple of buccaneers. 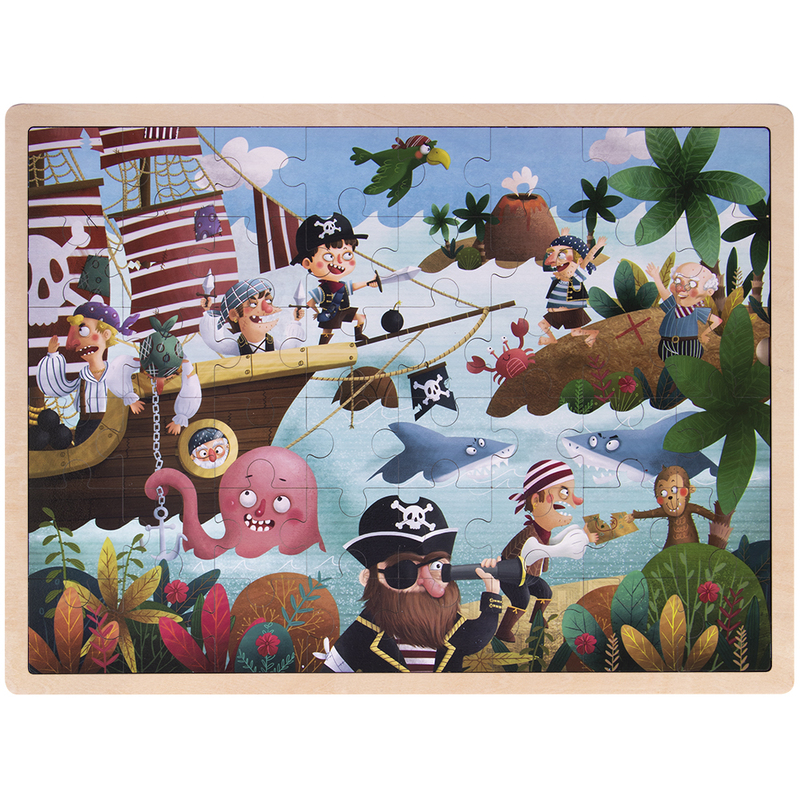 Each of the 48 pieces fit in the 15.75" x 12" wooden inset frame, so you can solve this treasure anywhere you go! These detailed illustrations with vibrant visuals enhance your little one's imagination as they put the pieces together. Watch as they set sail on a voyage of problem-solving skills and fine motor skills one piece at a time. Doesn't matter if it's a text conversation, a social media feed, or a stickered puzzle cube, everything is better with emojis. It's just science. That's why we're pretty confident this emoji puzzle cube is scientifically the perfect product. You just can't beat the combination of the brain-training, obsession-driving, collectible, delectable puzzle cube with some of our favorite, loveable emoji characters. Displayable and playable, the cube itself is your standard 57 x 57 x 57mm size and made from tough hardy plastic, but with one huge improvement: a virtually pop-free new mold. We've tested it against some pretty heavy deforms and drops, and this puppy hangs tough. It's lubricated and quick right out of the box, so go ahead, give it a spin! Just watch out for poop. Piece Together a Wild Adventure! Ollie and Mr. Noodle are ready to explore the great outdoors! Piece together some safari animals, shady trees, and a few mischevious monkeys. 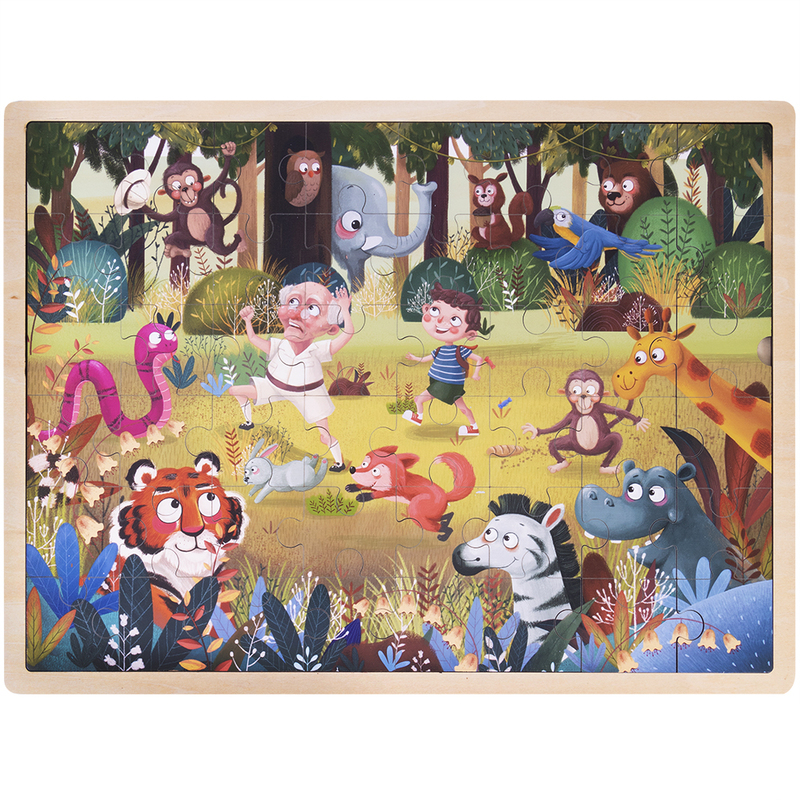 Each of the 48 pieces fit in the 15.75" x 12" wooden inset frame, so you can solve this safari anywhere you go!